METUCHEN — For Sarah Ryan and the Bernards High School girls basketball team, overcoming adversity was key on Monday night in the Bulldog Holiday Tournament Final against host Metuchen. As the fouls began to pile up and slowing down Metuchen’s star Cassie Smith became increasingly difficult, Bernards looked to Ryan to emerge victorious. En route to claiming Tournament MVP honors, Ryan scored 30 points and pulled down 11 rebounds, leading Bernards to a tough 56-44 victory. In the second half, when it looked like a lead was going to slip away from Bernards for good, Ryan rescued her team, scoring 19 of her points, with 12 of those coming at the free throw line. The Mountaineers were 21-for-32 from the line, with Ryan leading the way, going 12-for-15. Sara Whelan added 12 points and Lex Demartino chipped in eight, as Bernards evened its record and got first-year coach Sandy Whelan her first tournament title. Smith, who led Metuchen with 34 points (7-for-15 FG, 20-for-21 FT), went to the free-throw line 10 on different occasions and drew a double-team every time the Bulldogs got into their half-court set. Ryan said that she and her teammates only learned how to play a box-and-one defense last week, but they executed it perfectly against Smith. “It was a tough game overall; I’m used to the box-and-one, but when I get two people put on me at all times, it’s tough,” Smith said. In the game’s opening 16 minutes, Smith got scored all but two of Metuchen’s points, converting 8 of 9 free throws in the first half, giving her 14 points at intermission. She continued to get to the line in the third quarter, when she went 10-for-10 and collected 16 points. But Ryan was there point-for-point, scoring 14 in the third and five more, all on free throws, in the fourth to keep Metuchen (1-3) at bay. “Sarah was the floor leader today; she was composed and she didn’t force anything. Good things happen when the ball is in Sarah Ryan’s hands,” Whelan said. Ryan picked up four fouls and briefly went to the bench at the start of the fourth quarter, but returned with 4:50 to go to help close it out. The teams combined for 41 personal fouls and Whelan picked up a technical late in the third quarter, after which Smith hit four free throws to turn a 30-28 deficit into a 32-30 lead. But Bernards hung tough, getting through full-court pressure and finding open layups on the other end. The Mountaineers shot 17-for-40 from the field, while the Bulldogs converted just 12 of 49 shots. “I was really proud of the girls’ composure, for a young team, they bought into the game plan and it paid off,” Whelan said. METUCHEN — After scoring just five points as a team in the first quarter, the Metuchen High School boys basketball team turned it on, using a 21-8 run in the second quarter en route to a 53-34 victory over Bernards in the Bulldog Holiday Tournament Final Monday afternoon. Tournament MVP Evan Collier got Metuchen going in the second quarter, sinking four 3-pointers and scoring 15 of his game-high 22 points. His fourth trifecta of the quarter came as time expired and gave the Bulldogs a 26-20 lead going into the locker room. Artie Flaherty added 11 points and eight rebounds for Metuchen and Hunter Clarke chipped in 10 points. For Bernards, Doug Demarrais led the way with 14 points and five rebounds, but the Mountaineers made just six baskets in second half, wasting a strong first quarter where they out-scored the Bulldogs 12-5. For Korellis, seeing his squad win a tournament on its home floor is a big boost for the rest of the season. “It’s huge to win and get a few extra home games and it feels great to be in front of our crowd and gain some respect in the blue division,” he said. NEW BRUNSWICK — In what is becoming a customary outcome, the South Brunswick High School girls basketball team limited its opponent to less than 30 points on Saturday. This time, in the All-Brunswick Holiday Tournament final, the Vikings yielded less than six points in three different quarters and got just enough offense to emerge victorious, 35-24 over East Brunswick. After winning 38-19 Friday against New Brunswick and eight days after allowing just 28 points to Woodbridge, South Brunswick (3-0) continued its great work on defense. The Bears scored just three points in both the first and third quarters and only five in the fourth to waste a second-quarter surge that saw them tie the score at 16-16 at intermission. “We played a very good first quarter and then we were very flat in the second quarter. It was a good lesson for us though; East Brunswick is not going to lie down and they came out, knocking down three’s and they were feeling it offensively,” South Brunswick coach Jeff Johnson said. Julia Simoes bookended the first half with a pair of 3-pointers for East Brunswick (2-1), one coming in the game’s opening seconds and the other as the first-half buzzer sounded. In between, reserve forward Kim Anderson got hot from the outside, making a pair of 3-pointers and another jumper from just inside the arc for eight quick points off the bench. Anderson also added four rebounds in sparse minutes for the Bears. Taylor Brantley controlled the paint for South Brunswick in the first half, collecting all eight of her points and six of her nine rebounds in the game’s opening 16 minutes. Brantley, along with Jackie Harrison, helped limit East Brunswick to one-and-done on many occasions Saturday, cleaning the boards and starting offensive chances for the Vikings. Harrison finished with eight points and 12 rebounds. “I’m really proud of the way we came out in the second half and we battled. We controlled the boards, so when their shots weren’t going in, it was one-and-done,” Johnson said. The Vikings outrebounded East Brunswick 37-17. South Brunswick has allowed just 71 points in three games, but its offense hasn’t exactly been in top gear. After scoring 58 points in their opener against Woodbridge, the Vikings managed just 73 points in the tournament. Johnson said that his team has been executing well, but the baskets just haven’t gone down. After getting herself into foul trouble early on, freshman forward Natalia Louhisdon scored all 10 of her points after intermission. Louhisdon made three out of four free throws late to clinch it for South Brunswick after the Bears intentionally fouled to put the Vikings in the bonus. EDISON — Despite tipping off at an earlier time than they’re used to, the J.F. Kennedy High School girls basketball team came out on the offensive Friday morning. Taylor Freeman got the Mustangs going with a pair of 3-pointers and Rachel Andrejcak took over in the third quarter, leading J.F. Kennedy to a 55-26 victory over Carteret in the first round of the Gene Haley Memorial Tournament. The Mustangs will play Edison in Saturday’s final at 12:30 p.m.
Andrejcak dominated the paint, especially coming out of the locker room after hafltime, when she racked up 13 of her game-high 21 points and eight of her game-high 16 rebounds in the third quarter. After opening up a 14-4 lead after the first quarter, J.F. 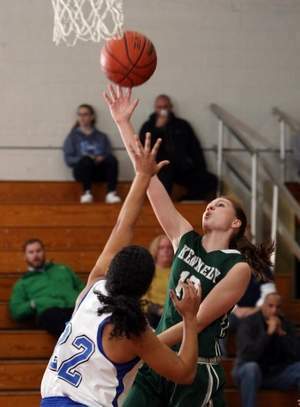 Kennedy never looked back, using an up-tempo style of offense to put Carteret away. Freeman had all 14 of her points in the first half, scoring seven in each of the first two quarters, and Sofia Tahzib teamed with Andrejcak on the glass, collecting 13 rebounds. Head coach Heidi Hodnett was pleased with her squad’s offensive performance, but spoke highly about the Mustangs’ ability to win the rebounding battle. J.F. Kennedy out-rebounded Carteret 47-31 in the game. J.F. Kennedy led 29-8 at halftime, taking advantage of 10 first half turnovers by the Ramblers. Carteret couldn’t get its offense on track, consistently having shots rim out and clang off the backboard. Courtney Hansen finally got into some offensive rhythm for the Ramblers in the fourth quarter, with the game no longer in doubt, scoring 10 of her 12 points. She also added eight rebounds in the contest. But neither Hansen or her teammates had an answer for Andrejcak, who muscled her way to loose balls around the rim and protected it on the defensive end. Hodnett was impressed with the junior’s ability to stay out of foul trouble and stay on the floor for as long as she did. With a sizeable lead entering the fourth quarter, Freeman and Andrejcak didn’t play in the final eight minutes, allowing reserve Brianna Hindy to come in and score six points in the fourth. “We’re still using every moment as time to get better, and this was a game we were able to do so,” Hodnett said. MONMOUTH JCT. — With all of the inclement weather recently, the South Brunswick High School girls basketball team had not seen action other than practice in the preseason in weeks. In fact, first-year head coach Jeff Johnson couldn’t remember exactly when they last took the court for a scrimmage against Bridgewater-Raritan. It didn’t matter much to the Vikings on Friday in the season opener, though, as they ran away from Woodbridge, building on a 15-6 first-quarter advantage en route to a 58-28 victory. Led by freshman Amber Brown, the Vikings were able to capitalize on Woodbridge’s missed jumpers and sloppy passing, more than doubling their lead at halftime, 29-12. Brown was the only player in the game to reach double digits in scoring, pouring in 13 points and adding four rebounds. South Brunswick gave Johnson his first victory as a head coach by spreading around the rest of the wealth, as five other players scored at least six points. Jackie Harrison scored nine points and added eight rebounds and Jenna Mastronardi and Casey Savoth each chipped in seven points. Johnson was particularly happy with the play of Mastronardi, who stepped in and ran the point in the absence of Allyson Berger, who missed the game for family reasons. Harrison and Mastronardi each scored five points in the second quarter, which ultimately did Woodbridge in. The Barrons committed three turnovers in the quarter, all of which led to South Brunswick baskets. With a pair of freshmen on the floor for extended minutes, Johnson was anxious that his seniors might not integrate the younger players into the offense. But Brown and Natalia Louhisdon looked comfortable on the court and the results showed. Louhisdon scored eight points and pulled down four boards in her first taste of varsity action. Brielle Bannister and Brianna Valdes each scored eight points for Woodbridge, which was trying to get first-year head coach Bob Timinski his first win. The Barrons couldn’t get their jump shots to fall in the second half, as they were playing catch-up. Woodbridge will try again for its first win of the season Monday afternoon against Metuchen. Having served as an assistant under previous head coach Beth Barrio, Johnson knows how important it is to get a Red Division win under his belt this early in the season. 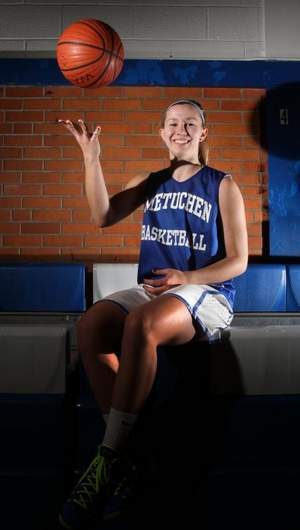 For Metuchen High School girls basketball star Cassie Smith, there’s been a tremendous amount of growth involved with her game since arriving as a freshman three years ago. Not only did Smith grow in stature, but her game has evolved vastly. Last season as a junior, Smith averaged 19.5 points and 8.5 rebounds per game, leading the Bulldogs to an 18-8 record and a berth in the Central Group I semifinals. Smith has become one of the Greater Middlesex Conference’s top players by working hard on and off the court. The prospect of Smith growing even more is a scary one to Metuchen’s opponents this season and if you ask first year head coach Pat Mayo, her star’s game is very well-rounded and should strike fear into anyone the Bulldogs play. Sixteen times last season, Smith scored 20 or more points, with a season-high 30 point effort against Dunellen on Feb. 11 leading the way. In two Central Group I games, Smith averaged 25 points and nine rebounds, standing out as a star for the Bulldogs. But, the biggest feat of her junior season came on Jan. 18 against Cardinal McCarrick. With a short jumper, Smith went over 1,000 career points, becoming just the eighth player in Metuchen history to reach the century mark. After scoring more than 200 points in the final 11 contests of the 2012-13 season, Smith stands fewer than 50 points from passing former head coach Val Gazda who posted 1,254 as a player. According to Mayo, Smith has a high basketball IQ, which helps her be so effective in pressure spots on the court. But for the first time in her career, Smith is going to be counted on to be a vocal leader on the court, managing an up-tempo offense and pressure defense that Mayo brings with her from a successful stint at Piscataway. But for now, Smith and her Metuchen teammates have lofty goals in mind, most notably going unbeaten in Blue Division play. They can get off to a good start on the front Friday against Middlesex in both schools’ season openers. Smith is committed to Bentley University following graduation and having the assurance that her career isn’t over when Metuchen’s season ends is comforting to her. “It’ll be sad when I leave here, but it won’t be as sad if I didn’t have more basketball ahead of me,” she said. Heading into the 2013 season, Bishop Ahr High School girls soccer coach Jim Tavormina knew that he had a solid group on his hands. What he did not know was that he’d be at the helm of the team that would capture the school’s first state championship, using a near-1000-minute scoreless streak in the regular season to set it up. Bishop Ahr (17-2-2) shut out Immaculate Heart 1-0 in the Non-Public A State Final, adding the icing to the cake of a dominant season. Tavormina is The Home News Tribune’s Girls Soccer Coach of the Year. One of his four-year standouts, midfielder Alexa Povelaitis, said that Tavormina was a coach she loved playing for, not only because of the results on the field. After allowing one goal in a 1-0 loss to Old Bridge on Sept. 10, the Trojans didn’t allow another ball to cross the goal line until the Greater Middlesex Conference semifinals against East Brunswick on Halloween. But after that defeat, Bishop Ahr refused to lose again, going on a run for the ages through the state tournament. In the first two rounds, the Trojans needed penalty kicks to beat St. John Vianney and perennial state-power Pingry, and yet another shutout over Holy Cross put them into the Non-Public A State Final against IHA. Tavormina said that playing a non-conference game before the GMCT helped in his team’s preparation for their deep postseason run. Tavormina, who is flanked by two assistant coaches during every game and practice, said that he couldn’t have done it without their help. Ernie Tenny, who’s been with Tavormina for all seven years at Bishop Ahr, and first-year coach Scott Laulette worked with the Trojans to get them prepared for anything they’d see this season. “I’m so happy for the girls and the coaching staff and we did everything you can do in the summer to get prepared. Every day we worked together and we saw the girls grow from the beginning of the season; they played with more confidence and we kept it positive,” Tavormina said. While her head coach believes that there’s a storybook script for the career of Sydney Rosa, the East Brunswick High School soccer star just wants to keep getting better every game and every season she plays. But one could argue that there is something special going on when Rosa steps on the field when the stage is at its biggest. As a sophomore in 2012, Rosa netted the game-winning goal in the Greater Middlesex Conference Tournament final as the Bears captured their 27th county title. This season, as a junior, she topped her own heroics, scoring a pair of second-half goals to turn a 1-0 deficit into a 2-1 victory and yet another conference crown. Rosa is The Home News Tribune’s All-Area Girls Soccer Player of the Year. After notching 15 goals last season, all while fighting Wegener’s granulomatosis — a disorder that causes inflammation of the blood vessels, that she said she’s now completely recovered from — Rosa found the back of the net 20 times this year. 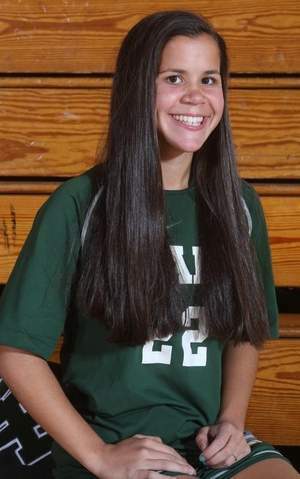 She scored in 15 different games, including seven in the postseason, as East Brunswick captured the GMCT title for a second-straight season. Rosa did all she could to get the Bears into a sectional final, registering three points in three state tournament matches in early November, but East Brunswick fell 3-1 to Hunterdon Central in the semifinals of the Central Group IV Tournament. Against Old Bridge in the GMCT Final, East Brunswick trailed 1-0 at halftime before Rosa went to work, winning a pair of one-on-one battles, putting her squad on her back in the process. When asked if she preferred the winning-goals in the GMCT in her sophomore or junior year, Rosa said every goal is special. Brady said that since Rosa came into his program three years ago, she’s done nothing but improve, under such extreme expectations. The night before the Somerset County Tournament Championship in early October, Bridgewater-Raritan High School gymnast Emily Shugan got the go-ahead to resume competing in all-around. Shugan had been limited with an ankle injury since August, and was working out with her club coach on the eve of the SCT. It was at that time when Shugan began going through her routines on all four events again, in preparation of helping Bridgewater-Raritan down the stretch of the season. After notching her best score of the season on the vault, the first event that the Panthers competed on that night, Shugan began to believe she made the right choice. After winning the bars (9.500) and beam (9.550) and coming in second on vault (9.375), Shugan was awarded a first-place tie for the all-around title with Hillsborough’s Sarah Pallay. Shugan also finished first at all-around in the NJSIAA Central II sectional meet and qualified for the state individual championships. She is the Courier News Gymnast of the Year. 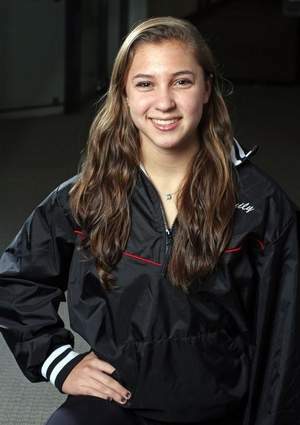 Shugan, who said she’s headed to the University of Pennsylvania to continue her gymnastics career, made it to the state individual meet all four years at Bridgewater-Raritan. She said she had no nerves at big events, instead reveling in the excitement of being with all of the other elite gymnasts in the state. She certainly had fun on Nov. 9, as Shugan’s all-around score of 37.175 won the Central II sectional. Shugan won the vault (9.600) and handled the pressure as well as she had hoped. A 14th-place finish in the final meet of her high school career in the individual competition, with a fifth-place performance on the bars (9.500), capped a great career for Shugan last month.